A pop-culture phenomenon at a time when documentaries were rarely released in cinemas, Hoop Dreams was one of the finest American films of the 1990s. 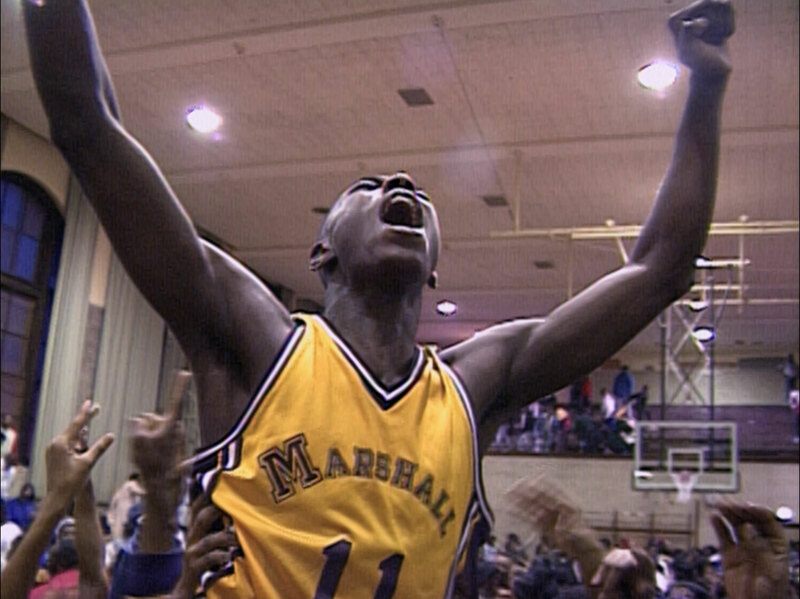 Originally envisioned as a half-hour documentary for PBS about a basketball court in a deprived area of Chicago, the project’s scope expanded significantly as director Steve James and co-film makers Frederick Marx and Peter Gilbert spent five years following Arthur Agee and William Gates, two teenage basketball players aspiring to make it to the NBA. While both boys were prodigiously talented, dramatic shifts in their personal and professional fortunes saw their paths diverge wildly. As it celebrates its 20th anniversary today, with a special screening Friday at the BFI London Film Festival, the film’s director spoke to us about Hoop Dreams and its long afterlife. When you started work on Hoop Dreams did you have any idea that people would still be talking about it so many years later? What was it about William and Arthur that made you choose them as your subjects? Steve James: The way you see it in the film was the way it happened. We were out with “Big Earl” Smith scouting playgrounds and he saw Arthur and said, “This kid is interesting to me.” Earl had this part-time job recruiting young ball players to certain high schools and knew all the courts in the city, which was why we were out with him. Me and my colleagues were complete basketball nuts, and we were going, “Which one? Which kid?” It wasn’t like Arthur was dominating the others. We were fascinated that Earl saw something in this raw kid on the court, and realised this whole recruiting thing was interesting. He took Arthur to St. Joseph High School and it just so happened that it was their coach Gene Pingatore who had told us about Earl, so it was serendipitous. Pingatore mentioned there was this other kid coming to the school that could be amazing, and that was William. We decided to follow both of them, thinking that maybe one of them would be our subject, and of course ultimately they both were. Why did you decide to go beyond your original half-hour premise? Steve James: The germ of the idea of following them over time came fairly early on, when Pingatore said to Arthur and his family that if he came to St Joe’s and worked hard at the grades and basketball he’d help him get into college. We thought it was such an extraordinary promise for this man to make to a kid he’d literally just met and seen play briefly. That led to us thinking it would be interesting to see what happens to a kid like this in four years. The way we presented it to the families was we would maybe check in once a month and see what was going on. That didn’t sound too demanding to them or us. For the first two years we shot a total of about 25 days, but then we became more obsessed as the story was evolving. By the end we shot a total of 100 days just during their senior year and its aftermath. If you watch the film you see the detail and complexities grow as the years pass, and that was due to a growing feeling that there was so much going on in these stories apart from basketball that we needed to capture as it was unfolding. As you spent more time with the boys was it difficult to not intervene when they faced difficulties – when Arthur’s family had money trouble, for example, or when his father Bo became addicted to drugs? Steve James: That’s the hardest thing to navigate in any kind of documentary film-making when you spend a considerable amount of time with subjects. I don’t think of myself and my colleagues as pure journalists. The key to being able to capture people’s lives in an intimate and open way is a relationship that goes beyond the usual journalist-subject relationship. It involves the subject feeling a level of trust and safety in order to open up. Where it becomes tricky is when things like money problems or other issues happen. I’ve always taken the view that I want to feel more like a human being at the end of the process than some kind of purely objective journalist, dispassionately bearing witness to people’s difficult lives, and so there were times when we did intervene. In the film William and Arthur both dream of making it into the NBA, but at a certain point their focus shifts towards the more tangible goal of getting into college. How did you feel about their changing desires? Steve James: I think that’s something that’s sometimes lost on people who like to say, with good intentions, “How can these kids possibly put so much faith in this basketball dream when the odds of making it to the NBA are so minuscule?” Yes, the odds are minuscule, but for the opportunity to get to college and possibly to even get a full or partial scholarship, those odds are far, far better. When kids like Arthur and William look around their neighbourhoods they don’t see doctors and lawyers and other professionals. They see guys who have been able to use sports to get out and go to college or get a job because they were a star, even locally, so that becomes a much more realistic dream to them. The tragedy of it all speaks to a larger tragedy, but you can’t fault them for seizing on something like basketball as a method of escape. Hoop Dreams is a morally complex film. For example, while Coach Pingatore’s assurances to Arthur are reckless when one injury can ruin a career, at the same time it’s clear he loves basketball and genuinely wants his students to succeed. Why did you feel it was important to avoid being didactic? Steve James: None of it was straightforward and I think too often we want to simplify these things. Frequently in documentaries – there are plenty of exceptions – people try to present things in a very black and white manner, to condemn or critique and not hold on to the complexity that I think is the higher calling of documentary. It was very clear to us that we weren’t going to make a film that was simply a diatribe against the business of sports. It is a business and there is exploitation but at the same time, it’s also this opportunity for those involved. Sports are something that so many of us are invested in as fans and participants. It’s complicated, and we wanted to hold on to that complicated reality. What was the experience of the film’s release like? Steve James: The year when Hoop Dreams came out was one completely unexpected thing after another. We didn’t expect it to make the splash it did at Sundance, or for Siskel and Ebert to go on their show and celebrate it, or for it to be the success it was. There’s no way we could have expected that when Arthur was at Arkansas State, Bill Clinton would make a pilgrimage to meet and hang out with him. I remember Arthur’s father Bo called me all thrilled. He was just out of his mind with excitement, and he goes, “Man just called me, said the President’s on his way to see him. He’s going to spend time with Man.” Man was their nickname for Arthur. He was laughing giddily, and I’ll never forget, he said, “Three years ago I was jumping roof to roof trying to get away from cops, and this morning the President of the United States is on his way to see my son.” That kind of summed it up. If one of them had been Catholic they probably would have met the Pope, you know?